Past Times, Changing Fortunes, a theme reflecting current economic concerns, seemed an appropriate topic for last year’s NRA National Archaeology Seminar. The annual seminar, held on 26 August 2010 at the Gresham Hotel, Dublin, was one of a multitude of Heritage Week events at which the country celebrated its past and hopefully, using the insights gained, looked a little more optimistically towards the future. 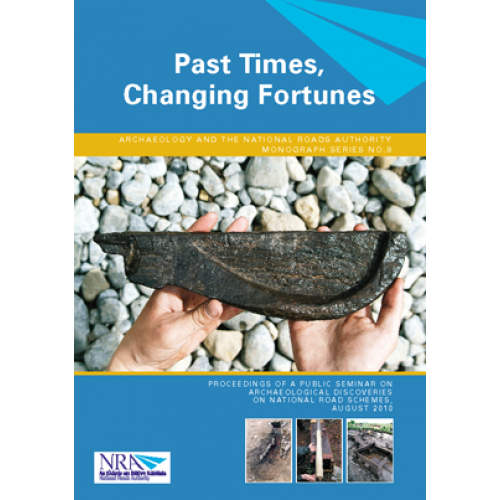 The speakers were invited to address the archaeological and palaeoenvironmental evidence of how the fortunes of the Irish landscape and people have changed over millennia. For instance, excavation results from the M1 in County Louth reveal how early medieval people built subterranean defences known as souterrains in response to Viking incursions and other strife. A previously unknown medieval settlement discovered on the Cashel Bypass in County Tipperary provides a rare insight into the vicissitudes of rural peasant life beyond the walled town. And the very people who wrought so much change on the Irish landscape also feature through vivid skeletal remains. Paradoxically, rather than shedding light on the cause of death, analysis often reveals more about the often difficult life of an individual, the living people who buried them and the complex evolving relationship between the living and the dead from prehistory onwards. Aspects of long-term environmental change are related here too, as reflected in the study of the natural archives of bog and lake sediments, palaeobotanical remains and insect remains, which enable the reconstruction of past vegetation and land use. Moreover, such studies help illuminate broader themes of intricate human–environment interactions at a range of time-scales. Welcome and uninvited change is a feature of every period, but fortunes never go unaltered for very long. The multiplicity of archaeological and palaeoenvironmental evidence for the many transformations experienced on this island and the resilience of its inhabitants throughout history is amply demonstrated in the latest proceedings.